Abu'l-Fazl 'Allami, The Ai'n-i Akbari, vols. 2-3, translated by H.S. Jarrett, edited by. J. Sarkar, New Delhi: Oriental Books Reprint Corporation, 3rd edition., 1977-78. Bor, J., "The Voice of the Sarangi: An Illustrated History of Bowing in India", National Centre for the Performing Arts Quarterly Journal, 15 (3, 4) - 16 (1), 1986-87, pp. 1-183. Chakravarty, I., "Problems of Reconstructing Kinnari Vina", Sarngadeva and his Sangîta-ratnâkara, edited by P. Sharma, New Delhi: Sangeet Natak Academi, 1998, pp. 282-88. Coomaraswamy, A.K., Catalogue of the Indian Collections in the Museum of Fine Arts, Boston, Cambridge, Mass: Harvard University Press, 1930. Day, C.R., The Music and Musical Instruments of Southern India and The Deccan, London and New York: Novello, 1891; reprint. Delhi: B. R. Publishing Corp., 1977; Delhi: Low Price Publications, 1990. Della Valle, P., Viaggi descritti in 54 lettere famigliari, Rome: 1650-58; translation. The Travels of Pietro Della Valle in India, vols. 1-2, edited by G. Havers et E. Grey, London: Hakluyt Society, 1892. Faqirullah (Nawab Saif Khan), Tarjuma-i-Manakutuhala & Risala-i-Ragadarpana, edited by Shahab Sarmadee, Indira Gandhi National Centre for the Arts, New Delhi and Motilal Banarsidass Publishers Pvt. Ltd., Delhi, 1996. Farmer, H.G., Studies in Oriental Musical Instruments, vols. 1-2, London: H. Reeves, 1931, 1939; reprint. Boston: Longwood Press, 1978. Fowke, F., "An Extract of a Letter from Francis Fowke, Esq. to the President", Asiatick Researches, 1, 1788, pp. 295-99; reprint "On the Vina or Indian Lyre", Hindu Music from Various Authors, edited by S.M. Tagore, Varanasi: Chowkhamba, 3rd edition. 1965, pp. 191-97. Imam, Hakim M. K., "Melody through the Centuries", translated by Govind Vidyarthi, Sangeet Natak Akademi Bulletin, vols. 11-12, 1959, pp. 13-26, 33. Kaufmann, W., The Ragas of North India, Bloomington: International Affairs Center and Indiana University Press, 1968; reprint. New Delhi: Oxford and IBH Publishing Co., 1993. Khan, Dargah Quli, Purani Dehli he halat, translated by Muraqqa'-i Dehli from Persian to Urdu by Khwaja Hasan Nizami, Delhi: Majub al-tabi'a burqi Press, 1933. Khan, Muhammad Karam Imam, Ma'dan al-musiqi, Lucknow: Hindustani Press, 2nd edition, 1925. Marcel-Dubois, C., Les instruments de musique de l'Inde ancienne, Paris: Presses Universitaires de France, 1941. Mersenne, M., Harmonie Universelle, Contenant la théorie et la pratique de la musique, Paris: 1636-37; reprint. Paris: Éditions du C.N.R.S., 1963, 1986. Miner, A., editor and translator, The Sangitopanisat-saroddharah: A Fourteenth-Century Text on Music from Western India, New Delhi: IGNCA, 1998. Sitar and Sarod in the 18th and 19th Centuries, Intercultural Music Studies 5, International Insitute for Traditional Music, Wilhelmshaven: Florian Noetzel, 1993; reprint. Delhi: Motilal Banarsidass, 1997. 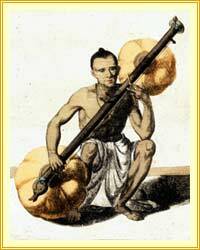 Nijenhuis, E. te, Dattilam: A Compendium of Ancient Indian Music, Leiden: E.J. Brill, 1970. Prajnanananda, Swami, Historical Development of Indian Music, Calcutta: K.L. Mukhopadhyay, 1973. Rizvi, S.A.A., The Wonder That Was India, vol. 2, London: Sidgwick & Jackson Ltd., 1987. Rogers, A. and H. Beveridge, translation, Tuzuk-i-Jahangiri or Memoirs of Jahangir, 2 vols., New Delhi: Munshiram Manoharlal, 3rd edition, 1978. Sarmadee, S., editor., Ghunyat-ul-munya: The Earliest Known Persian Work on Indian Music, Bombay: Asia Publishing House, 1978. Sarngadeva, Sangitaratnakara, with the Kalanidhi of Kallinatha and the Sangita-sudhakara of Simhabhupala, vols. 1-4, éd. S. Subrahmanya Sastri, Madras: The Adyar Library and Research Centre, 1943-59. Solvyns, F.B., Les Hindoûs, ou Description de leurs murs, coutumes et cérémonies, vol. 2, Paris: by the author, 1810. Tagore, S.M., editor., Hindu Music from Various Authors, Calcutta: Punchanun Mukherjea, 1875; reprint with the 2nd part, Calcutta: I. C. Bose, 1882; Varanasi: Chowkhamba, 1965. Thackston, W.M., editor and translator, The Jahangirnama: Memoirs of Jahangir, Emperor of India, New York and Oxford: Freer Gallery of Art, Arthur M. Sackler Gallery and Oxford University Press, 1999. Widdess, R., The Ragas of Early Indian Music: Modes, Melodies and Musical Notations from the Gupta Period to c. 1250, Oxford: Clarendon Press, 1995. Zebrowski, M., Deccani Painting, London: Sotheby Publications, Berkeley and Los Angeles: University of California Press, 1983.